Last half term, the School Council submitted an application for the House of Commons ‘Speaker’s School Council Award’. The award is open to every infant, primary, secondary and SEN school in the UK and aims to showcase and celebrate the work of School Councils throughout the country. School Councillors worked together to collate evidence and present the work completed earlier this year, around road safety. The application detailed the awareness that had been created, the assemblies and workshops run by school council and involvement with parents, pupils, staff, the local community and local authorities. 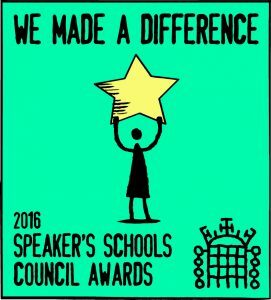 Thank you very much for submitting your school council project to the Speaker’s School Council Awards 2016. To celebrate the school council’s achievements, we have been sent a House of Commons digital web badge which is now displayed on our website. The School Councillors are inspired and fuelled to continue working hard and are already thinking of ideas for campaigns, ready to apply again next year!